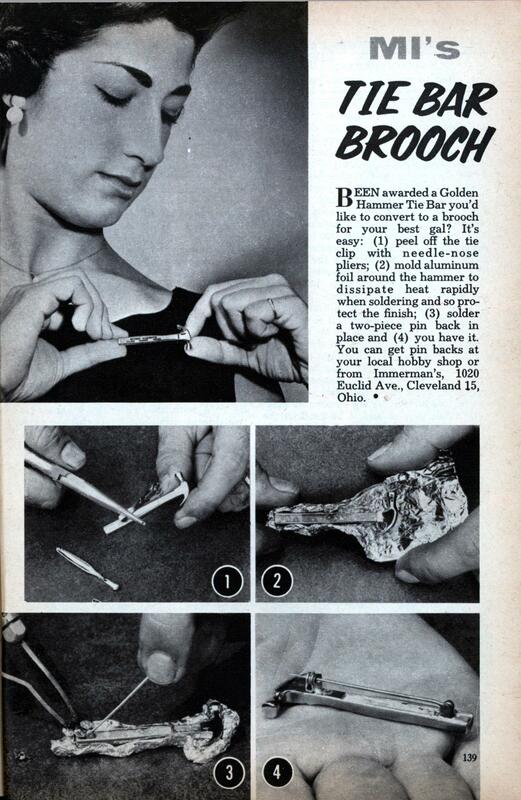 BEEN awarded a Golden Hammer Tie Bar you’d like to convert to a brooch for your best gal? It’s easy: (1) peel off the tie clip with needle-nose pliers; (2) mold aluminum foil around the hammer to dissipate heat rapidly when soldering and so protect the finish; (3) solder a two-piece pin back in place and (4) you have it. You can get pin backs at your local hobby shop or from Immerman’s, 1020 Euclid Ave., Cleveland 15, Ohio.